They are Nigeria's tomorrow, yet many feel they have little say in its future. They are the under-25s who make up 60 percent of Africa's most-populous country while an ageing elite dominates its politics. Their advanced age has not escaped the millions of young people, called out to vote in Nigeria's sixth election since civilian rule was restored almost two decades ago. "It's always the same lies, the same corruption. Nothing has changed for us," said Femi Edu, a 19-year-old street vendor in the commercial capital, Lagos. Nigeria is one of Africa's largest economies, but jobs for young people are scarce. Edu sees little reason to support the country's leaders -- or even vote. "All we want is jobs but they are not even able to provide it to us," he said. 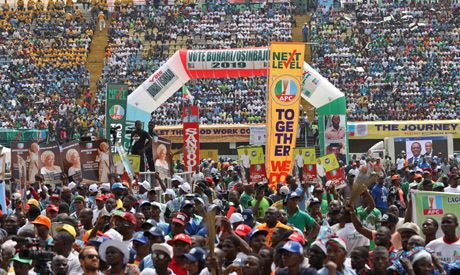 But many like Edu simply do not believe that either of Nigeria's two main parties can address the endemic corruption that has hobbled the oil-rich country of 190 million people. "Youth believe that politics is dirty. They feel like their votes do not count," she said. "Most of them are more interested in leaving the country to study in Canada and find better lives," said 30-year-old singer Chioma Ogbonna, who also performed at the shows. "That's the reason why the youths are registering," she said. "If people get their voter card, it's to be able to get a visa, to open a bank account, not necessarily to vote." "Those who vote are the poorest, who are really at the bottom of society. Their stomachs are empty, so in exchange for a sack of rice, they'll give you their voice," she said. "It's going to take one or two generations for things to truly change." After years of intense lobbying by civil society, Nigerian lawmakers in May 2018 passed the "Not Too Young To Run" bill, which lowered the age limit for presidential candidates to 35 from 40 and for governorship candidates to 30 from 35. Chike Ukaegbu wasted no time in launching his campaign for the presidency following the law's passage. "I had never thought of running for president before last year," admitted the 35-year-old, whose age makes him the youngest of 73 presidential candidates. "We can no longer use (age) as an excuse," said Ukaegbu, who splits his time between Nigeria and New York. "We are the majority and it is up to us to change the narrative of our nation." His campaign slogan is "sell hope." "We must start from somewhere," he said.